The statistic service (or stats service) is implemented in buildbot.statistics.stats_service. Please see stats-service for more information. A list of storage backends. These are instance of subclasses of StatsStorageBase. (str) The name of this service. This name can be used to access the running instance of this service using self.master.namedServices[name]. Please see stats-service for examples. A list of storage backends. This method is called automatically to verify that the list of storage backends contains instances of subclasses of StatsStorageBase. This mehtod is called automatically to reconfigure the running service. Internal method for this class called to register all consumers (methods from Capture classes) to the MQ layer. Internal method for this class to stop the stats service and clean up. Internal method for this class to stop and remove consumers from the MQ layer. (str) The name of the data being sent or storage. A dictionary of key value pair that is sent for storage. This method should be called to post data that is not generated and stored as build-data in the database. This method generates the stats-yield-data event to the mq layer which is then consumed in postData. 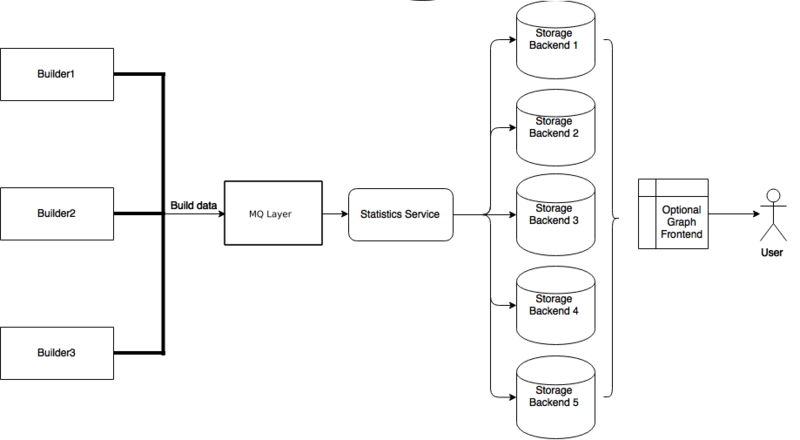 Data is captured according to the master config file and then, is sent to each of the storage backends provided by the master configuration (see stats-service). Each storage backend has a Python client defined as part of buildbot.statistics.storage_backends to aid in posting data by StatsService. A abstract class for all storage services. It cannot be directly initialized - it would raise a TypeError otherwise. A dict of key-value pairs that is sent for storage. The keys of this dict can be thought of as columns in a database and the value is the data stored for that column. (str) The name of the time-series for this statistic. (Optional) Any other contextual information about the data. It is a dict of key-value pairs. An abstract method that needs to be implemented by every child class of this class. Not doing so will result result in a TypeError when starting Buildbot. InfluxDB is a distributed, time series database that employs a key-value pair storage system. (str) The URL where the service is running. (int) The port on which the service is listening. (str) Username of a InfluxDB user. (str) The name of database to be used. A list of instances of subclasses of Capture. This tells which stats are to be stored in this storage backend. (Optional) (str) The name of this storage backend. This method constructs a dictionary of data to be sent to InfluxDB in the proper format and sends the data to the influxDB instance. Capture classes are used for declaring which data needs to captured and sent to storage backends for storage. (tuple) The routing key to be used by StatsService to register consumers to the MQ layer for the subclass of this class. The callback registered with the MQ layer for the consumer of a subclass of this class. Each subclass must provide a default callback for this purpose. A method for providing default context to the storage backends. The routing key which was registered to the MQ layer. Same as the routingKey provided to instantiate this class. The message that was sent by the producer. (dict) The key-value pair being sent to the storage backend. (str) The name of the series to which this data is stored. (dict) Any additional information pertaining to data being sent. (str) The name of property needed to be recorded as a statistic. This can be a regular expression if regex=True (see below). The callback function that is used by CaptureProperty.consumer to post-process data before formatting it and sending it to the appropriate storage backends. A default callback needs to be prois provided for this. A dictionary of all build properties. (str) Name of the build property to return. The consumer for all CaptureProperty classes described below. This method filters out the correct properties as per the configuration file and sends those properties for storage. The subclasses of this method do not need to implement this method as it takes care of all the functionaltiy itself. See Capture for more information. (dict) The dictionary returned by the data API containing the builder information. (str) The name of builder in which the property is recorded. (str) The name of property needed to be recorded as a statistic. The callback function that is used by CaptureProperty.consumer to post-process data before formatting it and sending it to the appropriate storage backends. A default callback is provided for this (see CapturePropertyBase for more information). See CapturePropertyBase for more information on this method. (str) The name of builder whose times are to be recorded. The callback function that is used by subclass of this class to post-process data before formatting it and sending it to the appropriate storage backends. A default callback is provided for this. Each subclass must provide a deafault callback that is used in initialization of this class should the user not provide a callback. A string used as a key in post_data sent to sotrage services. A method that takes in the msg this consumer gets and returns a list of arguments for the capture callback. This is an abstract method which needs to be implemented by subclassses. This method needs to return a list of parameters that will be passed to the callback function. See individual build CaptureBuild* classes for more information. A helper method that returns an error message for the consume method. The callback function for this class. See CaptureBuildTimes for more information. A python datetime object that denotes the build start time. Returns a list containing one Python datetime object (start time) from msg dictionary. See CaptureBuildTimes for more information on this method. See CaptureBuildStartTime.__init__ for the definition. A python datetime object that denotes the build end time. Returns a list containing two Python datetime object (start time and end time) from msg dictionary. See CaptureBuildEndTime.__init__ for the definition. Returns a list containing one Python datetime object (end time) from msg dictionary. The callback function for this class. See CaptureBuildTimes for more. See CaptureBuildDuration.__init__ for the definition. (str) The name of data to be captured. Same as in yieldMetricsValue. The callback function for this class. The default callback takes a value x and return it without changing. As such, x itself acts as the post_data sent to the storage backends. The consumer for this class. See Capture for more. (str) The name of the builder on which the data is captured. See CaptureDataBase for more information on this method.